New model of self-regulatory mechanisms for Yoga – David R. Vago, Ph.D. The manuscript specifically poses a novel theoretical model of the potential self-regulatory mechanisms by which yoga facilitates adaptive reactions to physical and mental stress. 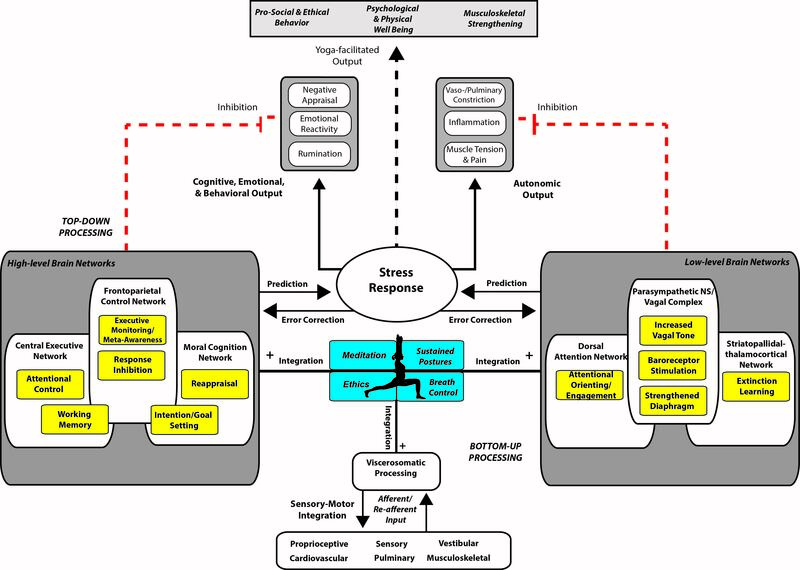 Our model proposes that yoga facilitates adaptive output (dotted lines), including long-term psychological and physical well-being, musculoskeletal strengthening, and prosocial behavior, through four primary factors in the context of stress: (1) an emphasis on interoception and bottom-up input, (2) more efficient bidirectional feedback and integration with top-down processes, (3) increased phasic inhibition (red lines) of maladaptive forms of emotional, cognitive, and behavioral output (e.g., reactivity, negative appraisal, rumination) as well as autonomic output (e.g., vaso- and pulmonary constriction, inflammation, and muscle tension/pain), and (4) perceptual inference rather than active inference for improved prediction and error correction processes. These four factors optimize self-regulation and improve the communication and flexibility by which top-down and bottom-up processes inform behavioral output in the context of physical and emotional stress. Through repeated yoga practice, there is a resulting skillful optimization of autonomic control in response to stressors on and off the yoga mat – keeping arousal at lower levels during stress-mediated challenge, maintaining positive appraisal and reinforcement, helping the practitioner stay relaxed with less effort, and facilitating rapid recovery of bodily systems under stress. A number of cognitive, emotional, behavioral, and autonomic mechanisms are proposed along with the underlying high- and low-level brain networks that support such mechanisms.